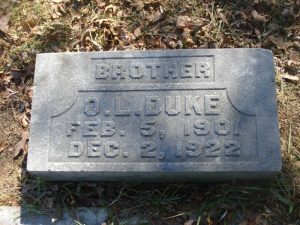 While browsing the archived Cedartown Standard newspapers on Georgia Historic Newspapers, I came across an article entitled Fatal Accident: Ollie Duke Killed in Rome. Mr. Ollie Duke, a Cedartown young man who has been employed for some time as a taxi driver in Rome, met with a tragic death last week. 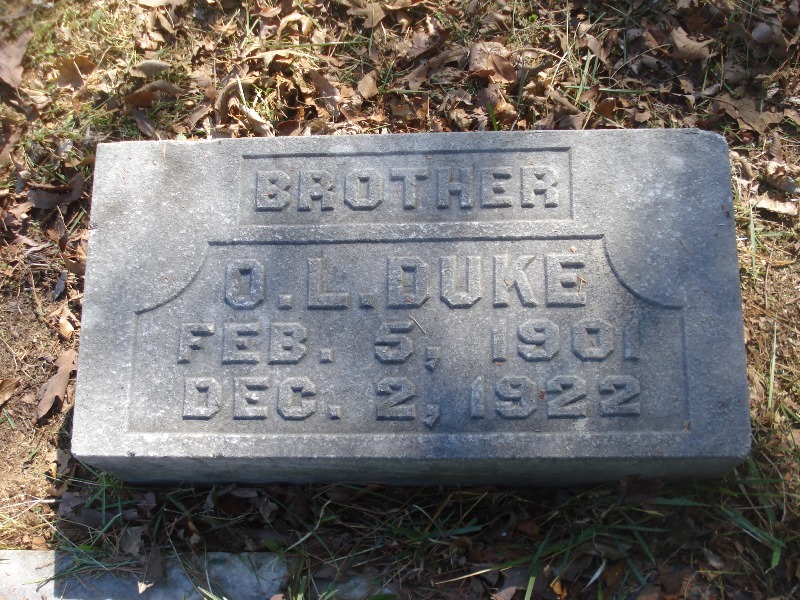 Mr. Duke was driving into Rome, and a team became frightened at the approach of his car and a street car at the same time, and the tongue of the wagon struck him in the side, inflicting injuries from which he died the next day at a Rome hospital. His parents, Mr. and Mrs. T. N. Duke, his sister Miss Atha, and his cousin, Mr. J. W. Isbell, went to Rome as soon as the news of the accident reached them. The remains were brought here Saturday night, and were taken Monday to Blooming Grove for interment, funeral services being conducted by Rev. C. A. DeVane. The family have much sympathy in their sudden and tragic bereavement. Coming from a distance to attend the funeral were his brothers–Virgil from Dallas, Tex., and Signar from Akron, O., Rev. and Mrs. W. T. Duke of Walnut Grove, Ala., Mr. Kirby Duke of Cullman, Ala., Mr. Homer Wheeler and Mesdames M. J. Henderson and L. Lucia of Chattanooga, Mrs. H. T. Garner and son of Atlanta. From a random search of a nearly 100-year-old newspaper to a solid and existing memorial. And if you’re feeling up to taking a little field trip, PCCPC’s website also includes detailed directions to the Polk County cemeteries. History matters, and there are so many stories just waiting to be rediscovered!